In the second quarter of 2017, ten years after the onset of the global financial crisis, the euro area finally started growing again. This was in contrast to countries such as the US, where recovery commenced earlier, already in 2009, and where it was sustained more successfully (ECB 2011). In a recent paper (Corsetti et al. 2019), we assess the reasons for Europe’s delayed recovery. We adopt an historical perspective, comparing the euro area with the European Monetary System in the 1990s. The parallels are suggestive. In both cases, countries with weak fundamentals experienced capital flight. In both cases, self-fulfilling expectations magnified and intensified currency and financial turmoil. In both cases, bond spreads rose to high levels, fragmenting financial markets across borders. In addition, the 1990s was a period of financial stress. This was true not just of Finland and Sweden, which experienced full-blown banking crises, but also of Italy, Denmark, and France. Previous analyses have underplayed the importance of banking stress in 1992-3. We seek to correct this in what follows. There are a number of potential explanations for the difference in outcomes. But the key was the success with which national central banks and treasuries backstopped banks and sovereign debt markets in the earlier crisis, interrupting the so-called diabolic loop (Brunnermeier et al. 2016). Backstopping and recapitalising the banks prevented financial stress from eroding economic activity, tax revenues, and debt market conditions. Investment and demand were not disrupted by a liquidity squeeze and binding credit constraints to the same extent as after 2009. Hence the earlier crisis was resolved in a matter of years rather decades. In contrast, the incomplete institutional development of the euro area limited the ability of the ECB and other European institutions to take analogous action in the recent crisis. Constrained by the euro area’s fiscal and financial rules, governments were not able to backstop banking systems prior to the creation of the Banking Union and the European Stability Mechanism. National central banks, having become members of the European System of Central Banks, were not able to backstop sovereign debt markets, which in turn worsened the banks’ balance sheets and aggravated distress in the financial system. Nor was the ECB prepared to provide this backstopping function prior to Mario Draghi’s “do whatever it takes” pledge in July 2012, more than two years after first Greek bailout. As a result, the euro crisis was magnified by negative feedback between banks and sovereign debt markets. 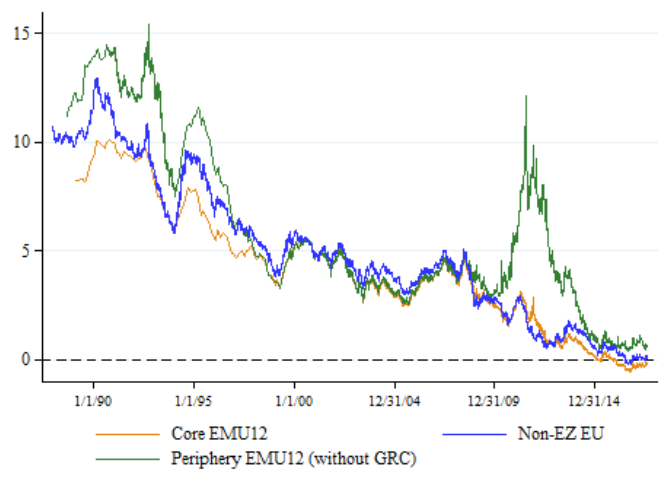 The shock triggering the ERM crisis was monetary contraction and demand expansion in Germany. Deficit spending on transfers to the new eastern lander following German reunification boosted domestic demand. To limit inflation, the Bundesbank raised interest rates. Any positive spillover from higher German demand was thus counterbalanced by the negative effect of higher interest rates. In 2008 the trigger was not an asymmetric demand shock in Europe itself, but the financial crisis originating in the US. This time, instead, an asymmetric financial response followed. Banks in core Europe lost their access to funding and incurred losses on their US asset-backed securities. In response, they curtailed their lending to the European periphery. The reversal of private capital flows, which had financed the current account deficits of the euro-area periphery prior to the crisis, meant that those deficits now had to be reduced. Historically, countries in similar situations had been able to achieve quick current account improvements by depreciating their currencies. This obviously was not an option in the context of a currency union. In the 1990s, a number of countries experienced substantial banking difficulties, but given the relatively limited size of bank balance sheets, the financial impact was, with a few exceptions, readily contained. Finland and Sweden experienced the most serious crises: Laeven and Valencia (2013) put the total fiscal costs at 13% for Finland and 4% of GDP for Sweden. In 1993, Danmarks Nationalbank was forced to provide standby liquidity support for the country’s second largest bank and was involved in finding solutions for five other distressed banks. 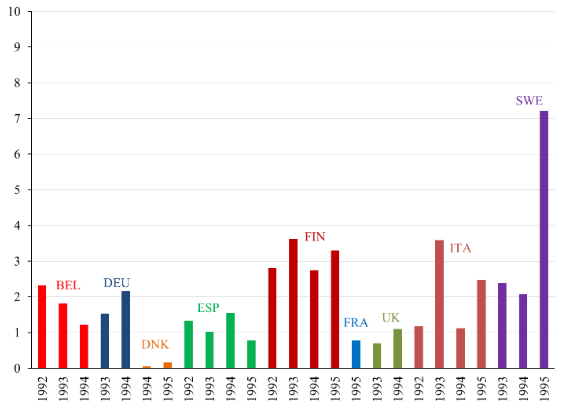 Interventions to backstop the Italian banking system between 1990 and 1996 cost the Italian government about one-half percent of 1996 GDP (Duca et al. 2017). Credit Lyonnais was bailed out by the French government in early 1994 after having incurred substantial losses in the preceding year. Other than the cases of Finland and Sweden, none of these banking problems rose to the level of systemic crises, but they could have posed serious problems for financial intermediation and economic activity had they not been successfully contained. In the more recent episode, banks were substantially larger, making for correspondingly higher costs when they had to be bailed out. Large core-country banks were already undercapitalised prior to the crisis, as a result of light-touch regulation, zero capital charges on investments in sovereign bonds, and the ability to book investments off balance sheet where they escaped capital requirements. Hence banks did not have sufficient capital to cover their losses, absent government support. The large size of banking systems exacerbated the problem in two ways. First, attempts to bail out troubled banks put substantial stress on public finances: recapitalisation and other restructuring costs ranged from 1% of GDP in France to 40% in Ireland (Laeven and Valencia, 2013) – contrast ‘just’ 13% in Finland in the 1990s. Combined with high inherited debts, this created pressure for larger fiscal consolidations in subsequent years, given the debt break enshrined in the European treaties. And fiscal consolidation there was, as shown in Figure 1. Second, because peripheral sovereign debt was concentrated in the balance sheets of banks in the originating countries, there existed a link between the condition of the public finances and the condition of the banks. The worsening balance-sheet condition of the banks and requisite bailouts had first worsened the fiscal situation of the government. But the worsening fiscal situation of the government now worsened the balance sheets of the banks, as sovereign bond prices declined, requiring further fiscal injections to the banking system, worsening sovereign balance sheets and raising questions about whether governments would have the capacity to continue backstopping the banks. In the earlier crisis, bank restructuring had substantial fiscal costs only in a handful of countries, as we saw above. As a result, there was less upward pressure on government bond yields. Yields actually fell below pre-crisis levels as early as 1994 (Figure 2). The fall in yields further limited the rise in debt ratios and had the additional benefit of protecting bank balance sheets from losses on government security holdings. Thus, even in countries with impaired banks, the doom loop between government debt and banking crises remained inactive, and the operation of the financial accelerator was contained. 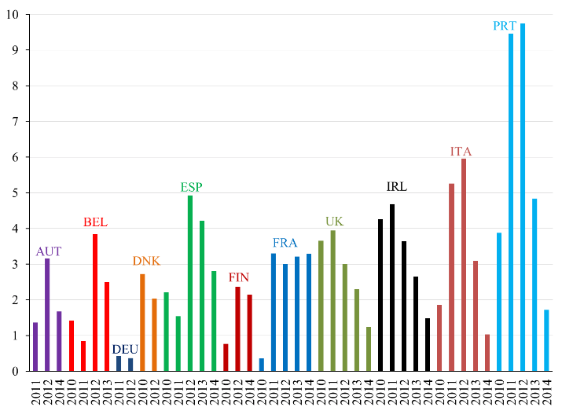 The rise in peripheral government sovereign debt yields in 2010 was both larger and more prolonged, with average euro area periphery sovereign yields (even excluding Greece) only converging to the average level of core sovereigns by the end of 2014. Yields began their descent only after Draghi’s “do whatever it takes” pledge, two and more years into the crisis. By this time sovereign debt problems had been allowed to undermine the condition of the banks – the doom loop had already been set in motion. By the end of 1995, the ERM crisis was effectively resolved. A majority of ERM members re-affirmed their commitment to adopt a single currency, while others – notably the UK, Sweden and Denmark – opted for remaining outside the currency area and instead embraced inflation targeting as their monetary framework. In contrast, in 2019, the time of writing, the euro crisis still remains unresolved, in the limited sense that economic growth in the euro area still needs the full monetary policy support of the ECB. What explains the longer and deeper downturn after 2009 compared to 1992-3? Our analysis suggests that the negative feedback between bank balance sheets and sovereign balance sheets was critical starting in 2009-10. The negative bank credit impulse and a negative fiscal impulse to which it gave rise reinforced one another. Because bank balance sheets were smaller in 1992, the adverse impact on sovereign balance sheets of bank resolution was smaller, and the negative implications for the fiscal impulse were less. From this observation follows the bottom line. Managing large shocks requires a credible backstop for banks and sovereign debt markets. This backstop is required to prevent the endogenous amplification of shocks. A backstop was available during the ERM crisis but not the euro crisis. The goal of euro area reform now should be to provide one. Authors’ note: The views presented in this column are of the authors and don’t necessarily reflect the views of the Federal Reserve Bank of San Francisco or the Federal Reserve System. Brunnermeier, M K, L Garicano, P R Lane, M Pagano, R Reis, T Santos, D Tesmar, S Van Nieuwerburgh, D.Vayanos (2016), “The Sovereign-Bank Diabolic Loop and ESBies,” American Economic Review 106(5): 508-512. Corsetti, G, B Eichengreen and G Hale (2019), “How Tying Odysseus to the Mast Avoided the Sirens but Led Him to Charybdis,” Federal Reserve Bank of San Francisco Working Paper no. 2019-04. Duca, M, A Koban, M Basten, E Bengsson, B Klaus, P Kusmierczyk, and J Lang (2017), “A New Database for Financial Crises in European Countries,” ECB Occasional Paper No. 194. ECB (2011), “Patterns of Euro Area and US Macroeconomic Cycles – What Has Been Different This Time?”, ECB Monthly Bulletin (May): 69-86. Laeven, L and F Valencia (2013) “Systematic Banking Crises Database” IMF Economic Review 61: 225-270. Pescatori, A, D Leigh, J Guajardo and P Devries (2011), “A New Action-Based Dataset of Fiscal Consolidation,” IMF Working Paper 11/128.